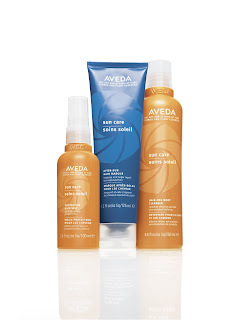 Aveda introduced a new three step hair care set that protects hair through the summer. Aveda was eco-conscious long before it was trendy and this new system follows that ideal by incorporating natural ingredients with a tropical aroma in earth friendly packaging. Step One: Aveda Sun Care Protective Hair Veil is a lightweight spray that is water resistant and lasts 16 hours to protect your hair from sun and environmental factors. The Hair Veil protects your hair from color fading and drying out in the sun. Step Two: Aveda Sun Care Hair and Body Cleanser rinses off chlorine, salt and product residue from hair and body. Kudos to Aveda for creating a 2-in-1 product, which is perfect when you’re packing for a getaway to minimize your load. Step Three: Aveda Sun Care After-Sun Hair Masque is a conditioning treatment that you leave in for a few minutes after washing to moisturize your hair post sun exposure. Find these products at Aveda stores and salons nationwide or Aveda.com.